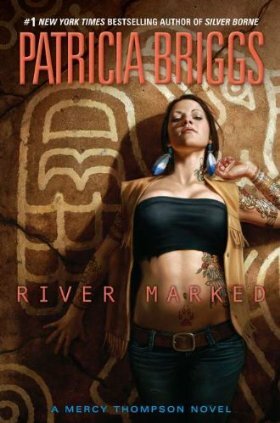 River Marked is the sixth book in the popular Mercy Thompson series by Patricia Briggs. 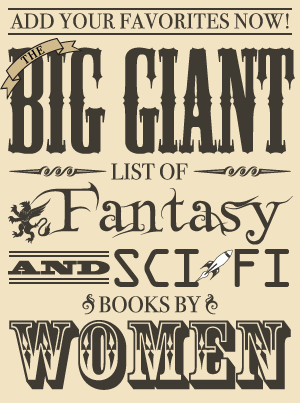 The previous books are in order as follows: Moon Called, Blood Bound, Iron Kissed, Bone Crossed, and Silver Borne. The next book is supposed to be released in spring 2013. Briggs also writes a related series with different main characters, Alpha and Omega, that will contain three books with the release of Fair Game next month. Since this is six books into the series, there will be spoilers for the first five books in this review. If you haven’t read any of the books yet, here’s my review of the first book. This is a series I highly recommend – it’s one of my three favorite urban fantasy series and the first one I really got hooked on back when I was a bit skeptical about how much I’d like the genre. Mercy is also my favorite urban fantasy character because she is so reasonable and practical, yet she also has a sense of humor and lots of personality. Briggs adeptly handles both plot and character development in this series and combines common myths in an interesting way. Once Mercy and Adam are married, they go on a peaceful honeymoon camping in the wilderness. At least, it was supposed to be peaceful, but life for Mercy is never dull for long. Stumbling upon a terrified man bleeding in the river leads Mercy to some full-blooded Native Americans, including a mysterious elderly man who seems to know more about Mercy’s father than he’s willing to share with her. As is often the case with mysterious elderly men unwilling to part with vital information, he sends Mercy on a quest to discover what he wants her to know for herself. Mercy discovers more about her Native American heritage and the river devil, a being that devours all it can, and the story of its defeat by Coyote. Once again, the river devil is killing people and it must be stopped – no matter what the cost. Although River Marked is a little different from the previous books, it’s now one of my personal favorites in the Mercy Thompson series, right behind Iron Kissed. It’s different because most of the regular characters are only present at the beginning and the end and most of the book takes place in the wilderness when Adam and Mercy are just trying to enjoy their honeymoon. It takes a while to get to the main plot since it spends some time on the wedding and then just showing Mercy and Adam together before revealing that all is not right in the woods. In spite of that, I was never bored by it because I enjoyed spending time with Mercy and reading her conversations with other characters. She and the other characters have such wonderful relationships that come alive through their conversations – and are constantly enhanced by a great sense of humor. He burned another hot dog while we sat together and watched the flames. “He was talking about my coyote half,” I said. With the increased focus on Mercy’s Native American half, the plot is heavily focused on Native American culture. I thought this new focus worked quite well, and it also introduced some rather interesting new characters. I don’t want to give away any spoilers so I’m not going to name any names, but there was one character in particular who is a new favorite in the series for me. He was incredibly well-written and Briggs illustrated his character wonderfully through dialogue and how he conversed with Mercy. The stakes are high in this one, and it had quite the exciting ending even if it is slower paced overall. Throughout it all, the highlight continues to be Mercy as a character and this book certainly shows more of what she’s made of. I love how practical she is and how she always seems to be in character. She doesn’t do things that make me wonder why she would do a thing like that, and she has so much personality that comes through her first person narration. This book also had some great emotional moments, especially Mercy’s wedding – but not for the romance. It was actually the time spent with other characters at the wedding that were most heart-warming, especially Samuel describing the fight between Bran and Zee over who would give her away and Bran’s comment to Adam when he did give her away. Seeing Mercy’s friends and family come together at her wedding and how much they cared about her was a high point. That’s not to say Mercy and Adam aren’t great together, though, because they certainly are. They love each other, but they still have their problems at times and seem like a very realistic couple because of it. River Marked is more focused on Mercy herself and exploring her Native American heritage than previous books, but I found this to be a very welcome development. It has the same characterization and sense of humor I’ve come to love and expect from the Mercy Thompson series, and I loved the incorporation of Mercy’s cultural roots.